Power Rogers & Smith, L.L.P. Holds the Record for the Largest Trucking Accident Award to a Single Family in Illinois! In the past two years alone, the Chicago truck accident attorneys at Power Rogers & Smith, L.L.P. have recovered over $260 million in truck accident cases. 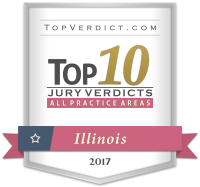 Our firm also holds the record for the largest personal injury award to a single family in Illinois - a trucking accident/wrongful death case. We understand the nuances of these cases and our team is prepared to offer advanced, strategic advocacy in the field of trucking accidents, injuries, and wrongful deaths. If you or a loved one has been involved in an accident with a commercial truck in Northern Illinois, don't hesitate to give our Chicago lawyers a call at your earliest convenience. While most truck drivers are law-abiding workers who responsibly own and operate their vehicles, there are some who feel they are above the law and choose to ignore the rules. The unfortunate result is thousands of serious yet entirely preventable accidents that often result in catastrophic injury or wrongful death. Brake Failure - 18-wheelers, semi-trucks, etc. have a difficult time braking due to the sheer size of the vehicle, which makes them incredibly dangerous when the driver fails to notice an oncoming hazard. When those brakes fail completely, the runaway truck could easily cause a catastrophic accident. Far too often, this failure is the result of negligence on the part of the driver and/or the trucking company. Commercial Driver’s License Fraud - Commercial trucks can weigh as much as 80,000 pounds when fully loaded, but even smaller trucks can be incredibly dangerous when an inexperienced or untrained operator is behind the wheel. In order to operate these vehicles, drivers need to go through extensive training and pass a test to receive their commercial driver’s license. However, this doesn’t stop people from faking their credentials. Hours of Service Violation - Strict regulations are put on trucking companies in order to prevent overworked and overtired drivers from remaining on the road. When companies pressure their drivers to break the rules and keep driving past their limits, or when a driver chooses to continue driving beyond what the law allows, it can put everyone on the road’s health and safety at risk. Drivers are required to keep a log of their travels, and when the numbers don’t add up, it could mean that they violated hours of service regulations. Improperly Loaded & Overloaded Trucks - Trucks are incredibly valuable to our economy and society because of how much each vehicle can transport at once. As long as the cargo is properly secured and within the vehicle’s weight limit, the risk of a potential crash is far lower than when it’s not. Improperly secured goods can shift during transit and cause the unbalanced truck to flip, especially during a turn, and overloaded vehicles have considerably more trouble braking in time to avoid a crash. Truck Driver Cellphone Use - Distracted driving is one of the most dangerous hazards on the road, no matter what vehicle the preoccupied driver is in. Distracted truck drivers are exponentially more dangerous because the vehicles they operate take longer to complete any safety actions like changing lanes or braking, and adding extra seconds to their reaction time could be the line between a near-miss and a catastrophic crash. Truck Driver Negligence - Understanding the events and actions that led up to a truck crash is an important part of the legal process. In many cases, crashes were influenced, if not entirely caused, by negligent behavior including speeding, ignoring the rules of the road, failing to take into account dangerous road conditions, and more. Our attorneys will investigate these factors and collect evidence to help prove your case in court. Truck Driver Substance Abuse - Driving under the influence is an incredibly dangerous choice far too many drivers make every single day. While the legal blood alcohol content for drivers using passenger vehicles is 0.08 percent, commercial truck drivers’ limit is only 0.04 percent. In addition to alcohol use, drug use is also highly regulated, and in most cases expressly prohibited. Drivers who use or abuse drugs and/or alcohol dramatically increase the chances of causing a crash and seriously injuring those involved. Truck Regulation Violations - In addition to strictly regulated hours of service, trucks, truck drivers, and trucking companies are heavily regulated in order to ensure safety for everyone on the road. However, some trucking companies and truck drivers ignore these regulations in order to cut costs, hide violations, pack in extra cargo, etc. Any violation can lead to a serious safety risk and a catastrophic crash. Truck Tire Blowouts - Tire blowouts can cause a driver to completely lose control of their vehicle, which can lead to a serious crash. Tire manufacturers keep most data on what causes their products to burst, but some causes these companies have identified as significant factors include over-inflation, under-inflation, overloading with cargo, general wear and tear, and poor or dangerous road conditions. Many of these issues can be prevented through consistent maintenance while failing to keep up to date with these safety checks can lead to serious failures and potential crashes. Under-ride Crashes - These types of crashes are so dangerous that specialized safety equipment was developed for trucks in order to prevent vehicles from sliding under trailers in a crash. However, research conducted by the Insurance Institute for Highway Safety found that this equipment is not actually strong enough to work as intended, even in low-speed crashes. Ignoring basic safety laws and regulations puts countless lives at risk every year. At Power Rogers & Smith, L.L.P., we have spent decades helping clients through the legal process, and we understand what it takes to secure the compensation you deserve no matter your situation. If you've been injured in an accident with a semi-truck, big rig, or tractor-trailer, you need aggressive and experienced representation. Call Power, Rogers & Smith, L.L.P. today at (312) 313-0202.
Who is At Fault in Semi-Truck Accidents? Fault in a semi-truck accident isn’t always difficult to determine. The truck driver may be at fault, but so may the truck driver’s employer, the entity responsible for the truck’s maintenance, a manufacturer of a truck part, or even a municipality/government for improper road maintenance and road defects. An experienced truck accident lawyer can determine and establish fault a number of ways, such as accident reconstruction and expert witnesses. Find out if you have legal standing to sue. The best way to do this is by contacting an attorney experienced in dealing with your type of case. Find out whom to sue. Civil lawsuits are filed by one party, a plaintiff, against one or more parties, the defendant(s). Plaintiffs sue those they believe to be responsible for their injuries or losses. Determine the jurisdiction in which your case should be filed (what state and what court). Determine the venue in which your action should be filed. Typically, the venue is the location the defendant(s) conduct business or the location the dispute arose. The next step is to file the complaint in the appropriate court. The important thing to remember is that you do not have to do this alone. With one of our experienced attorneys as your legal counsel, you can rest assured that we will take care of the technicalities for you. Our Chicago truck accident lawyers are committed to securing justice for victims. Call us at (312) 313-0202 today to learn more and schedule a free consultation.